It’s a month of full moons, black cats, and of course little munchkins ready to scare. 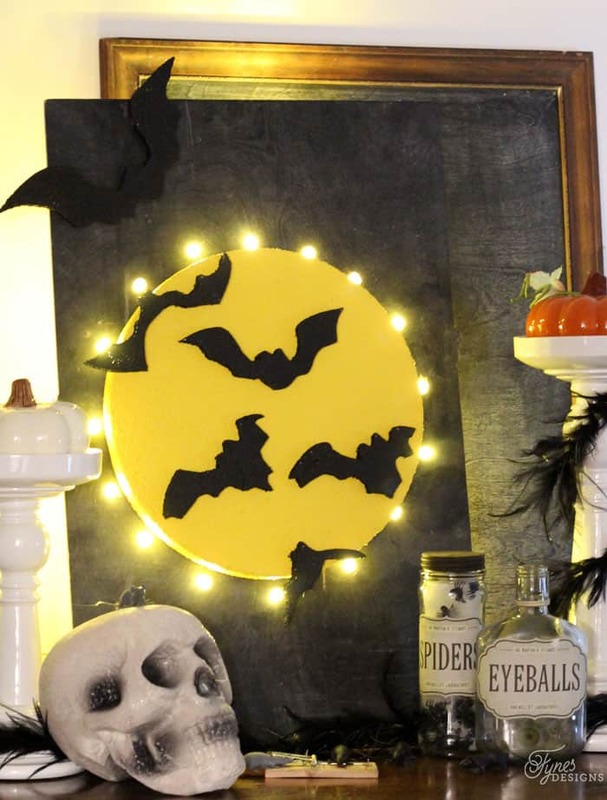 Now that we’re into October I wanted to share a fun spoooooky Halloween Full Moon Marquee Sign I’ve been making with some products from Make It: Fun® Foam. The best part about making crafts with foam, is it doesn’t take any expensive tools, just a serrated Make It: Fun® Foam knife and Smooth Finish filler, so you’re able to paint your creation. 1 hardboard measuring approx 18″high, by 14″ wide (I used a scrap piece of meranti) Home Depot has these pre-cut. First you will need to cover the foam with a thin layer of smooth finish, allow to dry. 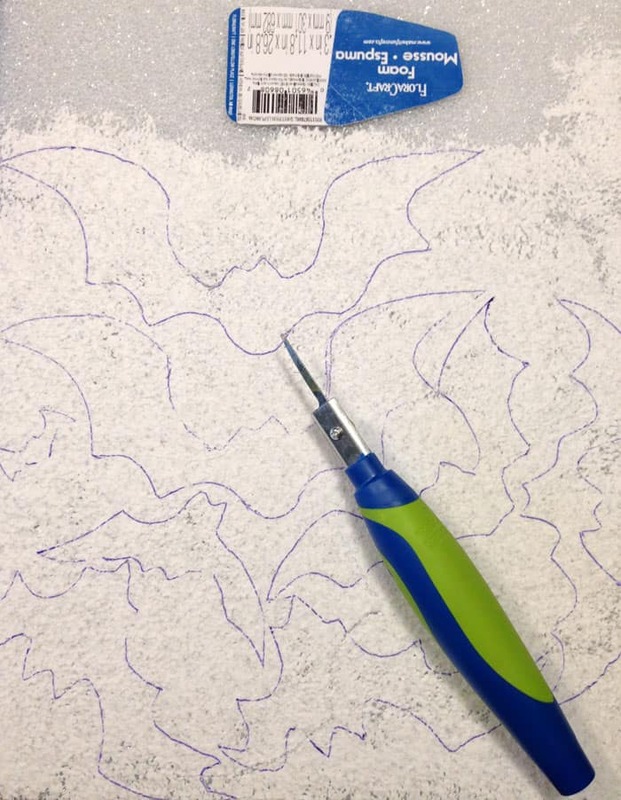 Create a template or free hand bats onto your sheet of foam. 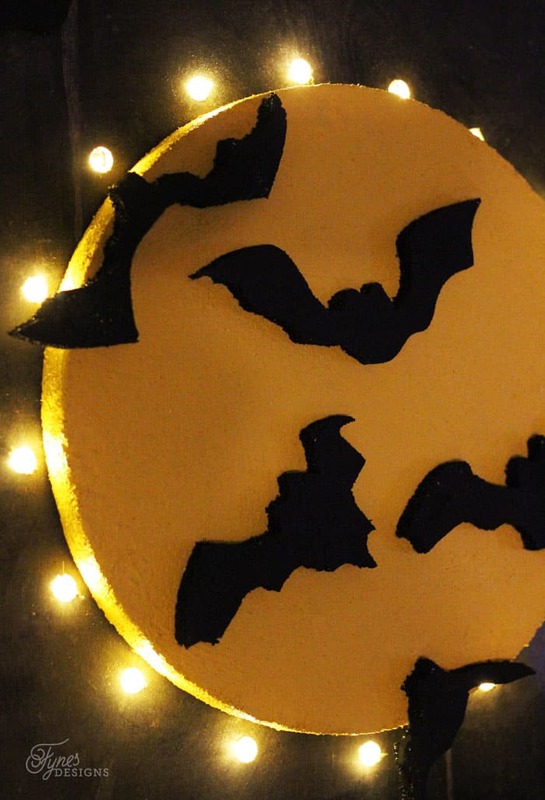 Using you serrated foam knife, cut out each bat shape. Paint all pieces including sides of your foam pieces, allow to dry. 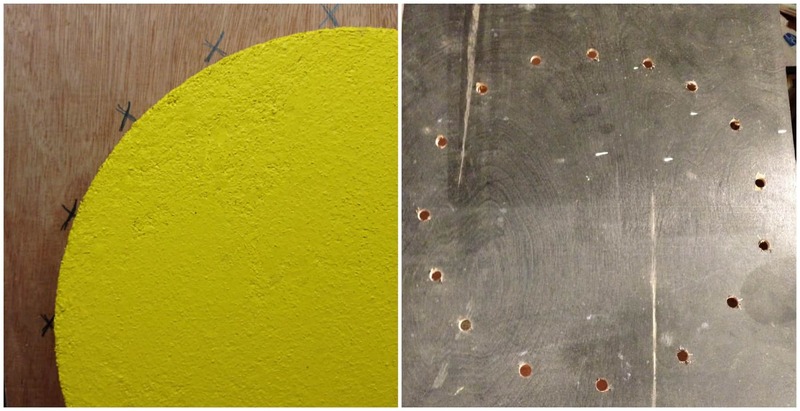 Lay your foam disk (moon) onto the back side of your board, mark where you will drill around the moon. Using a drill with a large bit drill where you have marked. Place a mini light in each hole from the back to the front. 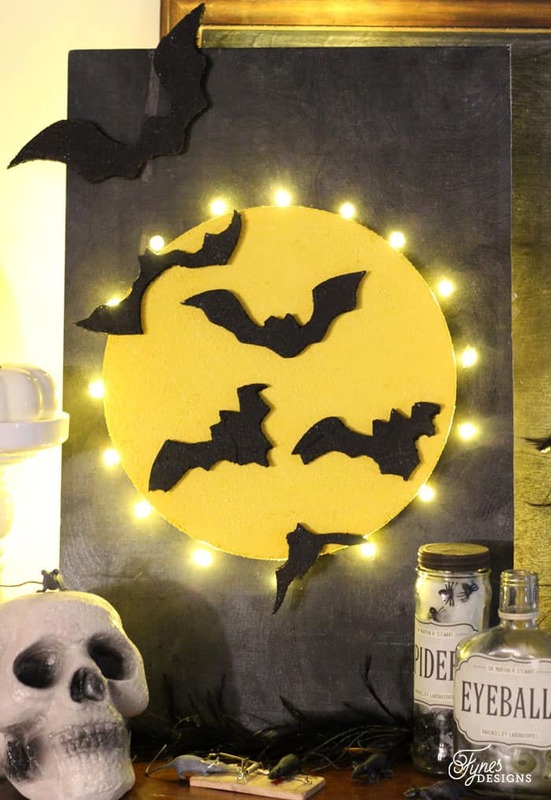 Plug in your sign, to give the glow of a spooooky marquee! 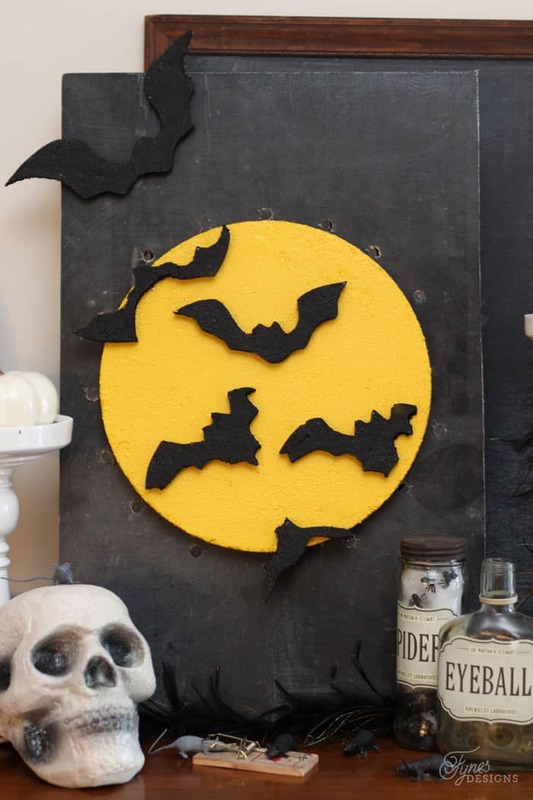 I love how simple and easy it is to create with foam, and so light weight, you can really hang it anywhere! Check out how I made those Halloween Apothecary Jars here. Hope you have an extra frightful Halloween! I’d love to see what you’re creating, swing by the Fynes Designs Facebook page to share what you’ve been working on! I love this! What fun for Halloween. Thank you! Thanks Sharon! It was fun to create! Great tutorial on how to make this! Fun! WOW that looks amazing girl!!! ove the lights around the moon! How spooky creative! Keeping this in mind for next year! Pinning! This is so striking! I really love it. I have a question about the materials, which call for a flat board and a piece of hardboard (18″x14″). Which piece do you use for which part of the project? Is the flat board used to mount everything on? What is the hardboard used for? Sorry if I just missed this in your directions. I really would love to make this! Thank you. Sorry I’m seeing your comment so late! The hardboard was the backing the everything was applied to. Hope you had a great Halloween! I love that the bats have different wing positions – makes the display more interesting and more authentic. Although I am a conscientious shopper, my budget limitations sometimes bring styrofoam trays into my house. They come in several colours, including black. I have some crafts that utilize them but could use more. These bats are a case in point. Perhaps you could experiment with them, including painting them, and adding a ‘green’ component to your craft. 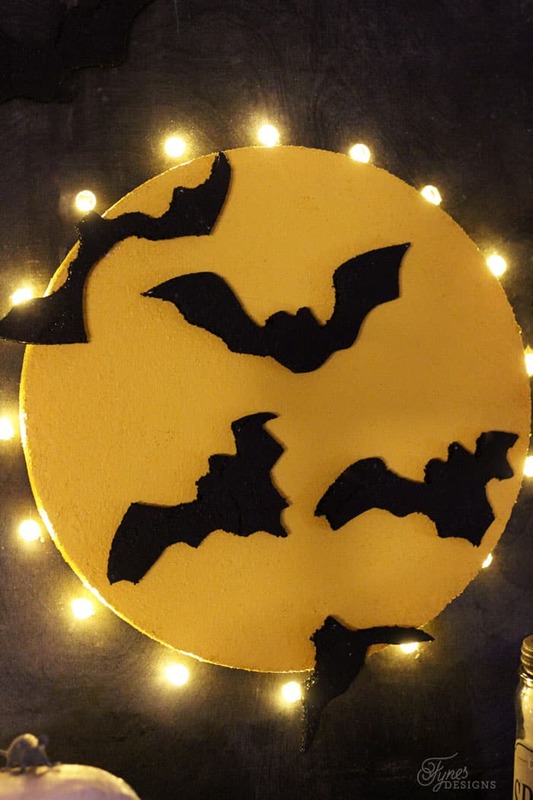 I plan to use your template to make bats with my black trays. Great idea! I had never thought of that. I tend to hoard all my trays for painting projects, never thought to use them for something like this.